Just as it does every year, Twitter has unveiled the top tweets of 2013, highlighting the year's trends on the bite-sized social network. Twitter began the "Year on Twitter" trend in 2010, and since then its format has gotten snazzier and snazzier. This year's categories are less vague than 2012's (what does "pulse of the planet" even mean? 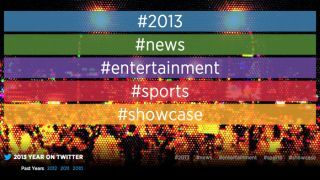 ), with top 2013 tweets divided into news, entertainment, sports and "showcase," a publishing partner-picked selection of the best tweets of the year. But the best category is undoubtedly the one that simply reads "#2013," as it highlights the major events of the last year month-by-month - in tweet form, of course. Twitter's 2013 year in review features hundreds of tweets covering everything from Jon Stewart's jabs at Microsoft to humble brags from Nascar super stars. The sports section is divided by sport, and the news section by category. Politics and big science stories are all covered, as well as "human interest" tweets like a marriage proposal and a lost dog returned home. The entertainment category is divided into music, TV, movies, and pop culture. What, no video games or tech? Even with the launch of the Xbox One and PS4? Shame! At least there's plenty of Breaking Bad love in there. It's fun to go through the #2013 category and check out the year's events month by month. What was your favorite thing that happened this year? Chances are it's in there, from #SFBatkid to the NHL Stanley Cup. The Golden Tweets section features the most re-tweeted messages of the year, and it's full of heavy hitters as well, including celebrity deaths like Cory Monteith and Paul Walker. The tweets in this section garnered hundreds of thousands of re-tweets each. "This year's most-retweeted Tweets showed the world coming together to share in loss, love, and celebration," Twitter wrote in the review. There's plenty to explore in Twitter 2013 showcase, but don't lose too much time combing through the past - the year's not over yet, and you've probably got work to do still. The holidays approach! Check out TechRadar's holiday gift guide, with tech and games galore.